There are basically two types of collectors: those who seek what they know, and those who seek what they do not know. I prefer the second kind. Among the record collecting friends that I know, there are a few Holy Grail projects that are often talked about. One of them is compilation with Middle Eastern beat records. There are a few of such records known, but not enough to fill a killer sampler. At least, that is what I thought until I bought it yesterday! 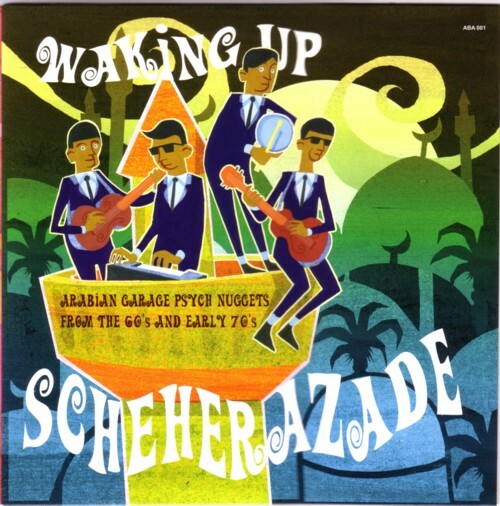 The LP (I was told that there are no CD’s) is called “Waking up Sherazade” and contains 18 songs from 45’s so obscure, that I have not even imagined them in my wildest dreams. All records were made in unlikely countries like Egypt, Lebanon and Algeria, etcetera. If you still think that young people in these countries only listened to traditional folk music in the sixties, you can prepare yourself for a Matrix-like mind shift after you have listened to this LP. This is wild stuff! To my complete surprise I noticed the name of Milan Hulsing as the artist who did the beautiful cover illustration. With a cover like this the LP is even more Holy Grail than it already is. Man, what a trip! Here is one of the more traditonal songs on the LP, which I choose because of the screaming girls. It is Ela tho by Morocco.